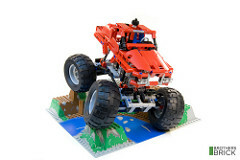 42005 Monster Truck is one of LEGO’s new assortment of Technic sets, and has an MSRP of $50 USD and 329 pieces. 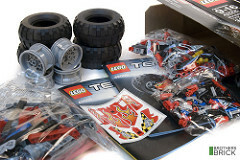 This year, LEGO entered an exclusive partnership with Toys R Us in the United States granting TRU exclusive retail rights to the Technic line. They’re still available online from sites like Amazon, and of course in the LEGO Brand Retail stores, but sadly, you will no longer find Technic sets at other retail establishments. That aside, LEGO’s new Technic line-up looks pretty cool. I’m not really a Technic guy, so this is the first Technic set I’ve bought in quite a while. I’ve enjoyed Technic sets for as long as I’ve been a LEGO fan, but I gravitate toward building System, so naturally my purchasing skews that way as well. 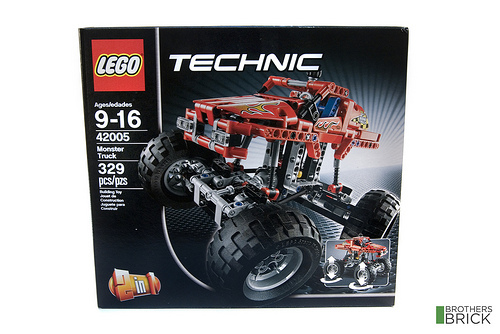 Like the Technic sets of old, most modern Technic sets follow the 2-in-1 box method, meaning that they have instructions for two complete models to be built with the same selection of pieces. The Monster Truck is, of course, the primary model here, but the set also builds a dune-buggy/hot rod type car. Thus far I’ve only had time to build the primary model. With only 329 pieces, the price seems a bit high if you’re used to System sets, but many Technic pieces are more expensive to produce than traditional bricks, and at $0.15 per part, the price is actually typical of Technic sets. Many of the largest Technic sets have lower price-per-part ratios, but that’s largely because the piece count is buoyed by insane numbers of Technic pins, which are very inexpensive. Opening the box frees three bags of pieces, a sticker sheet, an instruction book for each of the two models, and four loose tires and hubs. If I had been building a set any larger than this, sorting the pieces would have been useful, since scrabbling for Technic pins amongst all the pieces can be tiresome, but it wasn’t an issue with this size of set. As with many Technic sets, it’s initially difficult to even tell what aspect of the vehicle the instructions have you build first. Unless you peek ahead in the instructions (or are far more familiar with Technic than I am) you just start building some complicated mechanism. In this case, the first part is the central steering gearbox. This Monster Truck contains a cool feat of engineering; it not only has dual-axle suspension, but it also has four-wheel steering. This is accomplished via a special hinge piece that I can only assume is crafted just for this purpose. This piece is essentially a hollow ball–and-cup joint that allows an axle to be threaded through the center from each side, connected by a universal joint. It only appears in five sets, and this is by far the smallest of those, so the set may be of interest to some people based solely on that. There are two included here, one facing the rear and one facing the front, and each houses the axle that controls the steering mechanism. Both the front and rear steering assemblies are identical; in fact, it’s not until the body is built as a finishing touch that front and rear have any meaning. The instructions then had me do something I have never before done (it’s probably not unique to this set, but I’ve never encountered it before). The instructions called for subassembly that served only as a temporary frame to hold the joints in place while other pieces were attached. Once attached, the subassembly was disassembled and the parts recycled into other areas later on. The finished model is quite cool. The truck has an indistinct pick-up truck body, which, as I mentioned previously, serves only for aesthetics. The mechanical aspects of the model are completely functional without it, and as such, this kit is ripe for easy customization, turning the body into any sort of vehicle you wish. The suspension is supported by four springs, giving each axle a good deal of travel. The four-wheel steering is controlled via a small gear protruding from the roof. The ridiculously large tires make the truck exceptionally easy to roll around on the carpet or over almost any obstacles. I was left wishing that the truck had some additional play-feature though, like a bumper mounted winch. All told, this is an excellent model. There’s not as much lasting play-value inherent in the instruction-built model as with the largest, motorized Technic sets, but there’s also not that hefty price-tag motorized kits have. With the exception of the new joints, the parts won’t be particularly exciting (but likely useful) to anyone with a good collection of Technic already, but this model would make an excellent foray into Technic kits for someone who has thus far stuck to System. I imagine it would also make a good gift to a young teenager who imagines they have outgrown LEGO. I’ve been eyeballing this set for a while since I’d like to try more technic based Bio-Vehicles and lack the technic stuff to do it. 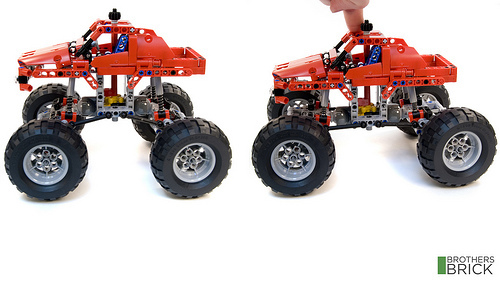 What I like about this set is that its basically a poor man’s 4X4 Crawler. I’ve been meaning to check out a reliable review from someone to sway me into purchasing it. How well does the steering respond? 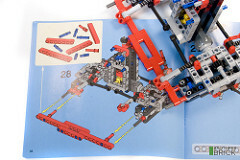 Is it stable and overall the construction sturdy or should I maybe look into an older technic set? 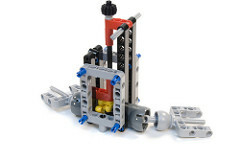 How well do you think the mechanisms could be assimilated into a MOC? What happened to your “don’t touch Technic with a stick” policy, TBB? Or are you trying to depreciate the Technic line by highlighting a 300-pieces set from a few months ago that went mostly unnoticed? @searme – We’ve never had any such “policy”. Not regarding Technic or any other LEGO theme. In fact our actual policies are few and far between. We have plenty of inclinations, habits and trends…but actual official policies are few and far between. Those that do exist have mostly to do with behind-the-scenes stuff. Regarding reviews, we allow our contributors to review any sets they want to, even ones that aren’t the biggest, newest or the most popular. Who wants to visit the various sites and read reviews of the exact same sets? I think our readers like hearing about sets that no one else is reviewing. @searme: Don’t listen to Josh, he’s a spin-doctor. We all HATE Technic, in fact we regularly hold strategy sessions regarding how to “depreciate” the line with greater efficiency. It all goes back to a dark day in Andrew’s youth when he was beaten senseless by a school-yard bully with a 8853. Forgot to mention, another great review Chris! The bit about the temporary frame was very interesting. @Dave: That’s a good comparison to 4×4 Crawler. The steering responds well, but the turn radius is not as tight as I would like, with a full turn being about 2 feet in diameter. After inspecting the steering mechanism, though, I believe that it would be a trivial operation to modify it to give it tighter steering. The overall build is extremely sturdy, and it would stand up to considerable punishment. The chassis with steering mechanism, shocks, and wheels would be pretty easy to adapt into another model; as I mentioned in the review, an easy alteration would be to simply swap the body for something different. You could also switch the wheels easily to something smaller. As for adapting the mechanisms without taking them as a unit; that will depend on your skill as a builder and how well you’re able to learn how the mechanisms works. I think that it shouldn’t be too difficult though to reverse engineer the steering and shocks and transport that knowledge to building a new vehicle from the ground up. The secondary vehicle uses a different steering and shocks mechanism that is a lot more compact, so there’s that to use, also.